In 2002, the three living subspecies of babirusa (formerly all included in Babyrousa babyrussa) were elevated to distinct species. Much of the scientific literature published prior to 2002 is on the Sulawesi babirusa, even though the scientific name B. babyrussa is used. The taxonomy of babirusas on the island of Sulawesi is not fully resolved, primarily due to a lack of specimens. 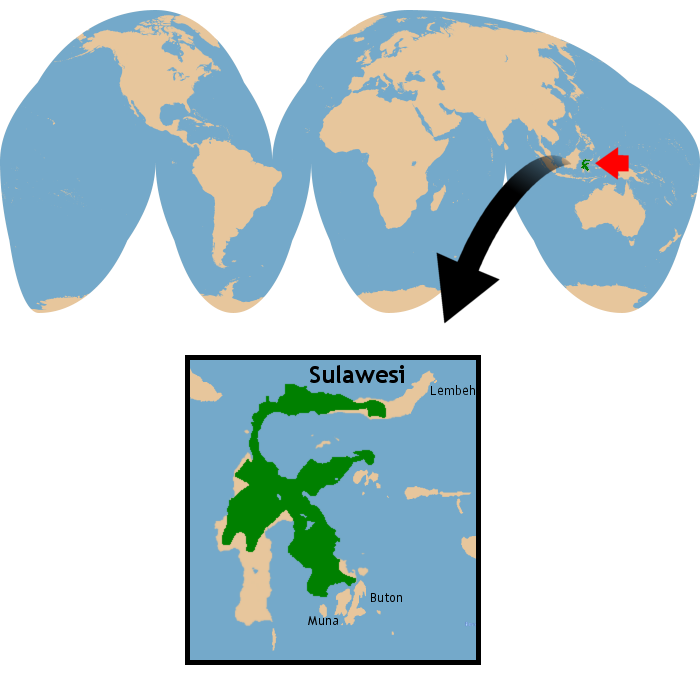 The majority of B. celebensis skulls in museum collections have come from the northern peninsula of the island, and it is unclear whether the babirusas from central and southeastern Sulawesi belong to the same species. A different babirusa species, Babyrousa bolabatuensis, has been described from subfossil skulls collected in southwestern Sulawesi, but is presumed to be extinct. 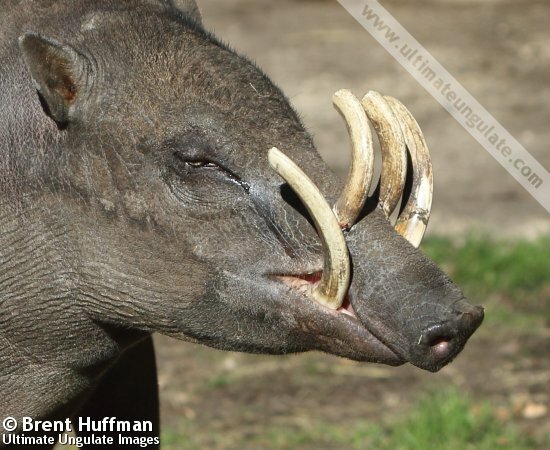 The Sulawesi babirusa has a typical pig-like form, with a barrel-shaped body and long face. The back is arched, accentuated by relatively long hind legs. 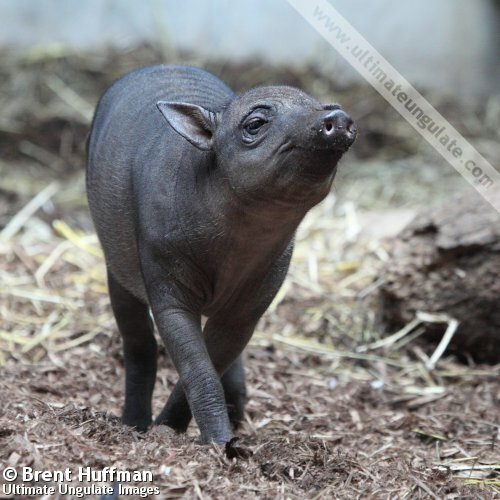 Unlike other members of the genus Babyrousa, the Sulawesi babirusa has very sparse, short hair on its body, appearing hairless from even a short distance away. The wrinkled skin is an overall gray, although the apparent color may vary due to the species' habit of wallowing in mud. The tail is long, with a sparse tuft of hair at its tip. The elongated face ends in a rostral disc ("pig nose"), and the ears are small and leaf-shaped. 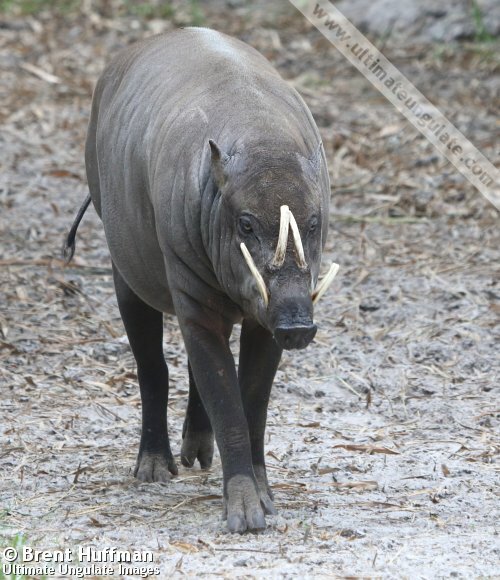 Male babirusa are easily recognized by the presence of impressive white tusks. The lower canine teeth extend vertically from the lower jaw and curl backwards, and the upper canines are rotated in the skull so that these teeth also grow upwards, piercing through the skin of the face and curling backwards. The heaviness of the upper tusks and their emergence well behind the lower canines are diagnostic of the Sulawesi babirusa. Females lack these obvious tusks, although the upper canines in some individuals grow long enough to just erupt through the skin of the rostrum. 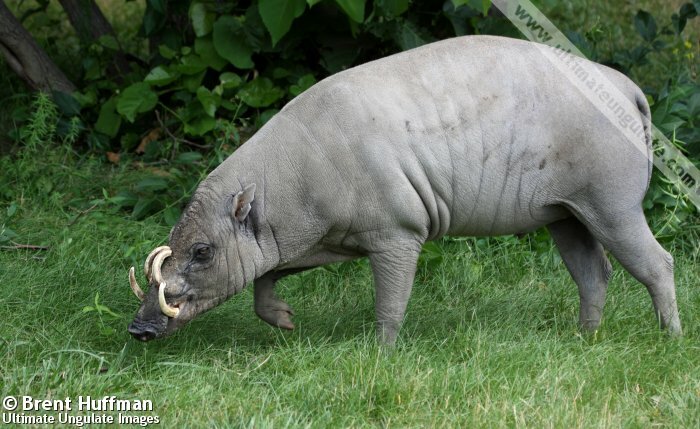 The Sulawesi babirusa is easily distinguished from the Moluccan babirusa (Babyrousa babyrussa) and Togian babirusa (Babyrousa togeanensis) by its nearly hairless appearance. Litter size: 1-2, very rarely 3. Weaning: Until at least 5 months, and perhaps up to 12 months, of age. Sexual maturity: In human care, both sexes may be mature by 10 months; in the wild this likely does not occur until after 1 year. 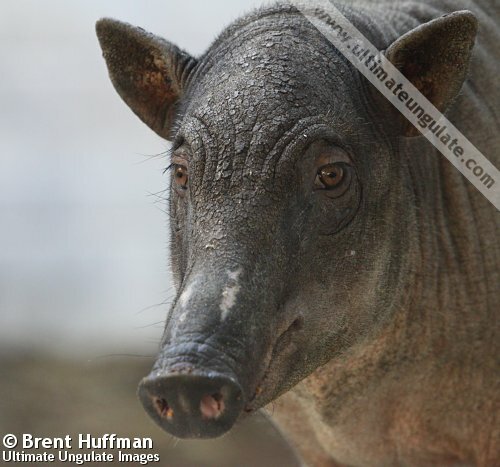 The Sulawesi babirusa breeds year-round. Expectant mothers collect vegetation and tunnel into the resulting pile to create a nest in which to give birth. The precocious babies are born without stripes or other markings (unusual among pigs), and weigh approximately 750 grams at birth. Nursing occurs with the female lying down. Development is rapid - infants start sampling solid food as early as 10 days after birth and mature in under a year. Dispersal has not been well documented, but a female may be accompanied by infants and offspring from a previous litter. There are limited studies of wild Sulawesi babirusa, and much of what is known comes from the study of animals in human care. This species is diurnal, foraging in the mornings and late afternoons, and resting at midday. In zoos, babirusa will collect bedding material and make a nest in which to spend the night. Many observations of wild Sulawesi babirusa come from open, swampy mineral licks, where they wallow in - and consume - the mineral-rich substrate. These pigs can swim well. Individually-identified males appear to reside in non-terrirotial home ranges, although scent marking (rubbing on trees, plowing in mud) has been documented. Although Sulawesi babirusa have a rostral disc like other suids, they do not root up vegetation or hard ground and only probe in soft substrate. They may follow troops of Sulawesi crested macaques (Macaca celebensis) in order to feed on food items dropped from the canopy. Males reinforce a social hierarchy by displaying at each other with upward thrusts of their heads. If neither opponent backs down, this may escalate to "boxing" with both males standing on their hind legs and paddling at each other with their forefeet. The bizarre tusks are not involved in aggression; since dominance is signalled by high-ranking males resting their head on top of the submissive animal's head, the arched upper canines of the submissive male may protect the dominant male from being poked by the lower canines. Females establish a hierarchy among themselves by lunging at the front legs of an opponent. Vocalizations include rattling screeches, low whines, and growling; females call to their young with a clucking sound. Family group: Small groups of one or two adult females and their offspring (groups rarely number more than 5 individuals, although up to 13 have been recorded). Adult males are often solitary, but may accompany a female group or be found in small bachelor groups of 2-3 males. Diet: Fallen fruit and leaves. Herbs, grasses, roots, and animal matter (invertebrates and small vertebrates) may comprise a smaller portion of the diets. The Sulawesi babirusa inhabits undisturbed forests on the Indonesian island of Sulawesi, including evergreen rain forest, riverrine forests, and swampy forest. Large fruiting trees are a critical habitat component. The northern peninsula of Sulawesi appears to be their last stronghold. This species was once found on the neighboring islands of Muna, Buton and Lembeh, although it has not been recorded on any of these in recent surveys. The approximate range is depicted in the map below. IUCN Red List: Vulnerable (2016). CITES Listing: Appendix I (2017). The estimated total population is fewer than 10,000 animals and declining. The species is fully protected by Indonesian law, but illegal hunting is still a principal threat, even in protected areas such as Lore Lindu National Park and Bogani Nani Watarbone National Park. 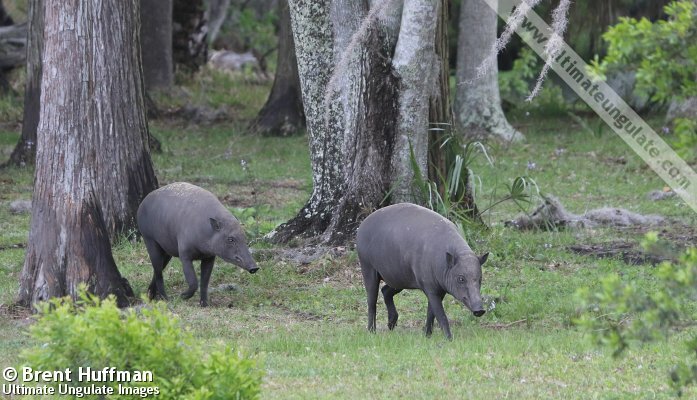 The Sulawesi babirusa is part of a global "one plan" conservation approach under the Action Indonesia umbrella.